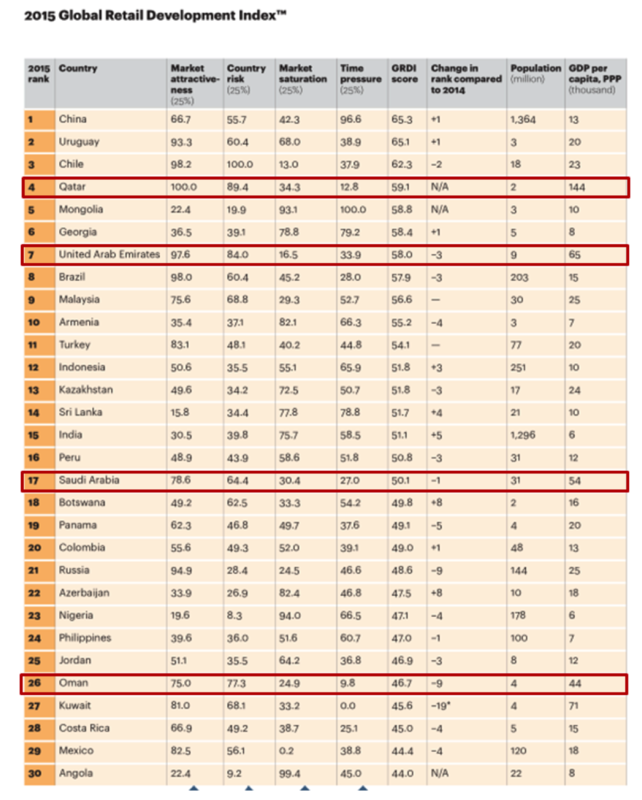 The A.T. Kearney’s Global Retail Development Index™ (GRDI) ranks the top 30 developing countries for retail investment. Using more than 20 macroeconomic and retail-specific variables, it comes out the most successful market today and the potential ones for the future. This year luxury goods is the special feature in which the survey focuses. It goes without saying that the UAE plays an important role, again. Despite the record drop in oil prices, retail sales growth is expected to continue. In fact, the retail space pipeline stays strong, with several projects underway in Qatar, in the UAE and Oman. Indeed, the Middle East keeps on welcoming international brands such as Macy’s (in the UAE) and Harvey Nichols (in Qatar), Ikea will open the largest distribution center in Dubai this year, Landmark group and Panda and the expansion from existing retailers. The Carrefour retail chain plans to be the new luxury version of itself and the first retail anchor to be confirmed for the new Mall of Qatar, which is expected to be the largest shopping area in the country. The UAE’s market continues to grow steadily, with retail sales growing 7% in 2014 and the amount of available retail space increasing steadily (1.6 million square meters). With its 9.5 million population, the total retail sales goes up to 70.9 billion dollars and gains the 7th place in the GRDI scale with 97.6/100 points of market attractiveness. 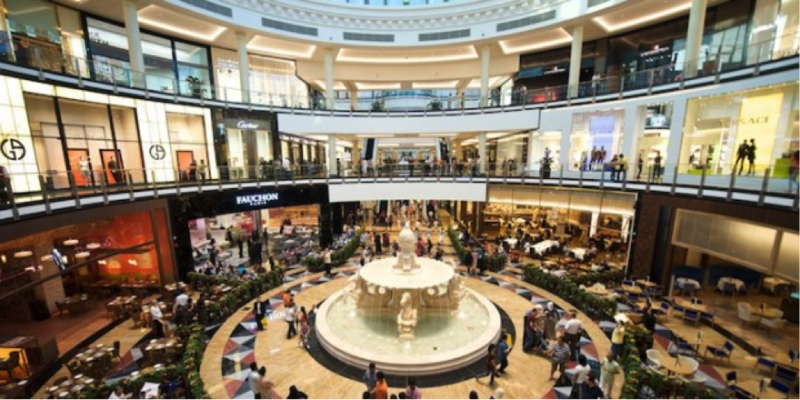 Although the market is saturating and the UAE drops from 4th to 7th in the GRDI (due to two new entries), Dubai is cementing its position as the Middle East’s retail hub. The city’s grandiose retail development has an increasing focus on the luxury segment. Dubai’s retail sector is pulsing and continues to be driven by strong economic growth, increased consumer spending and tourist arrivals (13.2 million of visitors last year). The world’s largest mall, Dubai Mall, recorded an average $1000-1200 in sales per square foot, with stores on the lower levels achieving the higher results. Moreover Dubai provides a wide range of opportunities for foreign retailers and brands, whether that is individual stores or franchise options. The real jewel in this survey is Qatar. Surprisingly Qatar makes a massive GRDI debut placing 4th, the highest in the Middle East. Thanks to stable economy, high GDP per capita, high levels of retail spending (12.4 billion dollars), growing population ( 2.3 million) Qatar is the new jewel in the Middle East pearls. Growth looks set to be particularly strong in the supermarket and hypermarket segment, with food products expected to be a key driver of sales. This is linked to a rising interest in healthier lifestyles. From now on the insufficient retail supply problem is fixed because Doha welcomes about 954,000 square meters by the end of 2015, rising to at least 1.8m square meters when more than a dozen operational malls in the pipeline are completed, according to forecasts. While the outlook for Oman is fairly positive and the market still shows plenty of retail potential, retail development has been slower than other market with a total retail sales of $11.9 billion. Retail sales are expected to grow at a steady 6 percent per year through 2020. One remarkable entrant this past year was Netherlands-based SPAR International, which opened two stores in Muscat in partnership with local company Khimji Ramdas and plans to open nine more by the end of 2016.